"It is I who hinder the sand from choking the secret chamber. I am for the protection of the deceased". Royal King who lives forever." 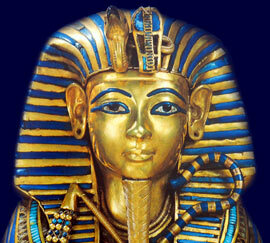 But where did the facts behind the idea of the Curse of King Tut originate? Magic Spells adorned the walls of many Ancient Egyptian tombs and inscriptions of spells were placed on various ritualistic objects placed in many royal tombs. These objects included amulets, statues and "magic bricks". But what exactly were these "magic bricks" that referred to magic spells? They were a set of four bricks made of mud which contained or were surmounted by divine images or symbols of various gods. The "magic bricks" often rested in niches along the walls of burial chambers. Statues rested on the "magic bricks" which served as hiding places for amulets or religious texts which were often in the form of spells taken from Chapter 151 in the Book of the Dead. I have smitten you enemies beneath you for you, and given you your head, eternally"
"I am your son, Osiris, I have come to be your protection. I have strengthened your house enduringly as Ptah decreed in accordance with what Ra himself decrees"
"I am your son, Osiris, I am your son Horus, your beloved. I have come to rescue my father Osiris from his assailant. I place him under your legs, eternally"
"I am your son, Osiris, I have come to be your protection. I have united your bones for you, I have assembled your limbs for you. I have brought you your heart, and placed it for you at its place in your body. I have strengthened your house after you, as you live, eternally"
The name of Osiris is repeated again and again in the following spells from Chapter 151 of the Book of the Dead. It should be noted that the living Pharaoh was seen as the embodiment of Horus, who was the son of Osiris. The Ancient Egyptians believed that at his death the pharaoh actually acquired the status of being Osiris. Therefore the Osiris that is referred to in the following spells is, in fact, referring to the dead pharaoh Tutankhamun. I will be your wrestler, I will be your attacker, I am the protector of the Osiris"
I am the protector of the Osiris"
him with the desert-flame. I have set aflame the desert. I have caused the path to be mistaken. I am for the protection of the Osiris. This is to repel the enemy of Osiris, in whatever form he may come." More misunderstandings and misinterpretations were made. Different curses were added. There was never just one specific Curse of King Tut. But the myths and legends, like so many, are indeed based on some truth, facts and the beliefs of the Ancient Egyptians. Each section of the website addresses all topics and provides interesting facts and information about the Golden Age of Pharaohs and of Egypt. The Sitemap provides full details of all of the information and facts provided about the fascinating subject of the Curse of Pharaoh Tutankhamun and the Four Magic Bricks.